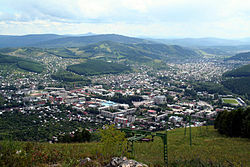 Gorno-Altaysk (Russian: Го́рно-Алта́йск; Template:Lang-alt, Tuulu Altay) is the capital city of the Altai Republic, Russia. In 2010, 56,933 people lived in the city. This page was last changed on 17 December 2017, at 15:34.